New for 2010, Mazda is introducing a completely revised line-up for its Mazda5 range of Compact Multi-Activity Vehicles (C-MAV) offering customers a choice of six models with upgraded equipment and even greater value. On sale 1 January, new Takara and Furano models replace the previous TS2 and Sport, while a selection of four powertrains and three equipment levels ensure that the Mazda5, with its unique sliding rear doors and seating for up-to-seven, will maintain its appeal as a great family car that also delivers a truly sporty driving experience. Prices for the four petrol and two diesel engined models start from £17,150 and £19,555 (on-the-road) respectively, with the 2-litre petrol automatic transmission variant (priced at £19,650) and the range-topping 143ps Furano diesel costing £21,555 and completing the line-up. Low-rate finance packages, plus low deposit requirements (from just 0%), make the 2010 Mazda5 highly affordable family transport. In addition, upgraded Mazda5 models are available for purchase under the new Government-backed scrappage scheme with an increased Mazda Allowance of £3,000, in addition to the £1,000 government contribution – so Mazda5 ownership can start at just £13,150. Mazda UK is also supporting the scrappage scheme by offering 6.9% APR^ finance deals to ‘scrappage sales’ customers. “Our simplified line-up for the upgraded Mazda5 range offers consumers excellent added value, while retaining the vehicles’ unique core features that have such a strong family appeal,” comments Mark Cameron, Mazda UK Sales & Marketing Director. “The availability of electric power for the sliding rear doors with remote operation, and a model with automatic transmission, highlight the convenience of Mazda5 ownership. 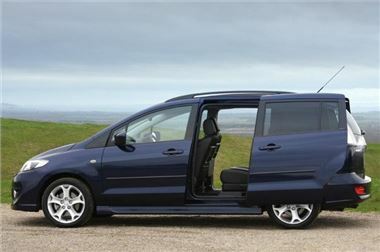 Our market research confirms that the majority of Mazda5 owners are 35-to-45 year old professionals with young families who enjoy a busy lifestyle and I’m sure they will find the new Takara and Furano models for 2010 especially attractive. “We will continue to market Mazda5 as a fine handling car that has our brand’s typically high driver appeal, with excellent refinement and aerodynamic efficiency (Cd is 0.29), plus a full complement of practical abilities to carry families in considerable comfort and safety,” concluded Cameron. Mazda5 is the only C-MAV with twin sliding rear doors, each with an impressive 700mm door opening, and that convenience is further enhanced by the availability of electric power for these doors (on Furano models). Inside, the upgraded Mazda5 features a uniquely communicative interior – with Mazda’s easy-folding Karakuri seating for up-to-seven people and maximum storage flexibility. For 2010 Mazda5 buyers can choose between eight body colours – including one solid paint (Brilliant Black), three metallic colours (Aluminium Silver metallic, Copper Red mica, Galaxy Grey mica and Stormy Blue mica), and three exclusive finishes for the Furano (Aurora Blue mica, Crystal White pearlescent and Radiant Ebony mica). 1. Typical 0% APR* finance on Mazda Conditional Sale (with 50% minimum deposit) up to 36 months. 2. Typical 3.9% APR** finance on Mazda Conditional Sale (No minimum deposit) up to 24 months. 3. Typical 3.9% APR** finance on Mazda PCP (No minimum deposit) up to 24 months. 4. Typical 5.9% APR** finance on Mazda Conditional Sale (No minimum deposit) up to 36 months. 5. Typical 5.9% APR** finance on Mazda PCP (No minimum deposit) up to 36 months. Typical 6.9% APR*** finance on Mazda Conditional Sale (No minimum deposit) up to 36 months. Typical 6.9% APR*** finance on Mazda PCP (No minimum deposit) up to 36 months. The engines, transmissions and running gear for the upgraded Mazda5 are carried over from the previous model. Both the petrol and diesel engines can be ordered with two power outputs – 115/146ps and 110/143ps, respectively. Two manual transmissions are offered – 5-speed for the 1.8-litre and 6-speed for the 2-litre engines, while the petrol 146ps 2.0-litre engine is also available with a five-speed automatic in the Takara model. Since 2008, the Mazda5 has been equipped with new dampers, front and rear, and increased rear toe-in geometry, which resulted in a more refined suspension providing enhanced ride comfort and maximum stability when cornering at high speeds and when fully laden. For the 2010 range, Mazda is ensuring that every Mazda5 is highly specified for its price band. Available from just £17,150 (on-the-road), the single Mazda5 TS model comes with front, side and curtain airbags, plus remote central locking, electric front windows, manual air-conditioning and a radio/single CD with four speakers and 15-inch steel wheels with trim covers. The three new Takara models bring customers additional equipment, including 16-inch alloy wheels, privacy glass, and a leather steering wheel and gear knob, creating a premium look and feel. The Karakuri storage box, picnic tables and integrated roof rails further supplement this highly specified model and complement a busy family lifestyle. Two new Furano models, which come with a choice of 2.0-litre petrol or diesel engine, offer buyers boosted specification with items such as leather trim, powered sliding rear doors, 17-inch alloy wheels, Sports styling kit, dusk sensing auto-lights and rain-sensing auto-wipers. Naturally, safety is paramount in a family segment vehicle so Mazda have equipped all upgraded Mazda5 models with Anti-lock Braking System (ABS), Electronic Brake-force Distribution (EBD) and Emergency Brake Assist (EBA) as standard. Further safety enhancements include dynamic stability and traction control systems (DSC and TCS) as standard on the Mazda5 Furano. Retail sales only. Subject to availability at participating dealers only on vehicles registered until 31 March 2010. *0% finance available on Mazda Conditional Sale with minimum 50% deposit required. **3.9% and 5.9% finance available on Mazda Conditional Sale or PCP. ^6.9% finance available in conjunction with Government Scrappage Scheme only. Finance subject to status. Terms and conditions apply. Applicants must be 18 or over. Guarantees/Indemnities may be required. Mazda Financial Services RH1 1SR. NB ‘On the road' prices include 17.5% VAT, number plates, delivery, 12 months road fund licence, first registration fee, 3 year or 60,000 mile warranty and 3 years European Roadside Assistance. All models are available with free 7-day drive away insurance.